Join Slow Food Vancouver Island & The London Chef for a series of Slow Fish Events celebrating our diverse coastal waters. Sea Things: Seaweed, Sea Urchins, Sea Asparagus and other sea things. An intriguing session about foraging from the beach and tidal waters. 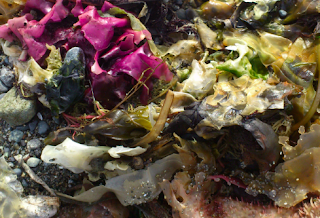 Learn about edible seaweed, the eco balance of our ocean gardens, and salt production. Diane Bernard will be providing foraged seaweeds to identify, taste and cook, we may not be wearing wellies for this session but we won't be lacking in coastal experiences. Special guests: Diane Bernard from SeaFlora, Dr. John Volpe from UVIC, Dr. Sinclair Philip from Sooke Harbour House, Chef Naotatsu Ito from Daidoco, and Andy Shepard from Vancouver Island Salt Co. Event Style: cocktail style with small plates, full meal, hands on learning, presentation & discussion. RSVP – please book directly with payment to The London Chef. Note: spaces are limited, each class size is approx. 16 to 24 people based on program. Cost: $75.00 for non members, $65.00 for members (memberships available at the event) Slow Fish Series $210.00 non members & $180.00 for members. Tax and Gratuity will apply to above prices. Please note: series prices may be limited by availability.